....yes, if we hope to make betting on horse racing a worthwhile pursuit, a trip to the racecourse does involve a certain amount of hard work. It's been awhile since I attended the Exeter meeting and it's time to review our systems and plan another foray to the racecourse. I subscribe to the TippingSports to obtain ideas on backing angles and tips. This will be the meeting at Wincanton on November 4th. This time out I hope to make use of our increasingly prosperous Lay System to warn of any dangers, although it will not be possible to lay any horses on course. Can I make a profit on the day? This is the question I asked myself prior to visiting Exeter racecourse early in the year. This time I will be attending Wincanton - also a right handed course where the going is rarely heavy. This meeting promises to be dominated by the Paul Nicholls, champion trainer whose stable is based in Ditcheat, Somerset. Both of these are Nicholls runners and likely favourites - I'm very confident of the lay system but it it is not infallible and Kicks For Free is a very strong favourite with likely SP in the region of 1-4. The answer may be to look for an each way bet and I feel The Big Canadian fits the bill. The 1.35 is more tricky but I like She's Our Native fron Evan Williams yard. The 2.45 as we saw has Kaldouas as a lay so I'm inclined to give Free Gift the benefit of the doubt whose trainer R Alner is in good form. 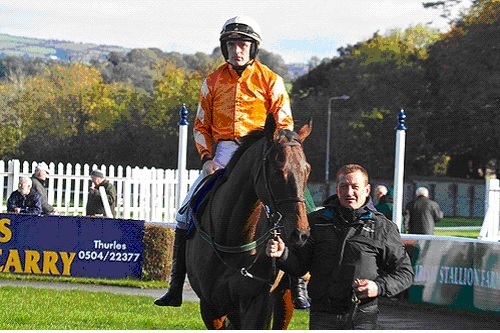 Ladalko has been laid out for the Badger Ales chase 3.20 and I am confident we will raise a glass to his success. Desert Quest is hard to oppose in the 3.55 with Noble Request likely to need the run - Faasel could be next best but cannot be relied on to try his best. The 4.25 can go to Lincolns's Inn - Nicholls and Ruby can't win them all and Richard Johnson will be really trying by this stage. Well I am now back home on Sunday and have had time to reflect on our on course betting on horse racing experience, for what turned out to be a day of mixed fortunes and at times heartstopping excitement. The first race went nicely to plan with Kicks For Free winning as expected but at 2-11, odds even shorter than I anticipated although 1-5 was available on course. However we went for an each way on the Big Canadian who duly obliged at 20-1, coming 3rd. The 1.35 put me in a quandary, as although I had chosen She's Our Native one of our horses to follow, Bold Fire was also running and in hindsight I should have backed both, as Bold Fire won at 9-2. The next went to our selection Turko as expected at 4-7 although he was far from convincing and probably prefers a left hand track as he continually dived left at his fences. In the 2.45 although we avoided Kaldouas as a lay selection, we came unstuck with Free Gift who appears to be in the grip of the handicapper and the race went to Pettitjean. Although only the winner and our selection finished and the winner could easily have gone the way of the rest as he almost tipped up at the 2nd last. Ladalko was our choice for the 3.20 but unfortunately unseated his rider at the 2nd fence. The problem was that he was squeezed to the edge of the fence by a crush of horses and his jockey's foot caught the wing and was catapulted from the saddle. So the failure was through no fault of his own and he continued the race gamely without his rider. Confidence at this point was beginning to flag and I deferred to my scout, Ses on the next race with a toss up between Desert Quest and Noble Request. I had earlier been inclined to consider Crow Wood, running off bottom weight and tippped by The Times and elswhere. Also the trainer of Noble Request, Phillip Hobbs had won the two previous races and it was unlikely for him to gain a third. However we decided on Noble Request as the horse with better value than Desert Quest and the mistake soon became apparent as our choice ran no sort of race and Crow Wood took the honours at 9-2. So it was down to the bumper and a hefty loss staring us in the face. As mentioned earlier I had tipped Lincoln's Inn but he was drifting in the betting and it was between the Nicholls horse, Mutual Respect and Kia Kaha. What swayed it for me was the fact that Jonjo O'Neill and Tony McCoy had yet to win a race and I knew The champion jockey would be doing everything, bar carrying the horse over the line, to put this right. So Kia Kaha got our remaining stake at 3-1 on course and duly obliged. So we ended the day recouping all our losses, with enough left over for a decent bottle of wine to celebrate. Will it be easier to pick winners on course? In the next couple of weeks I hope to answer those questions, so let's get started on maximising our chances of an enjoyable and profitable day out. To demonstrate what is available on this site I intend to record all the steps involved in achieving that end. I have decided to attend a meeting at Exeter and the first thing to do is check the online calendar which tells me they have a meeting on Sunday 12th February. To quickly find a meeting at any course, click the search button at the top right hand side of the Calendar. Type in the name of the course, then click search. It will show all the meetings at that course for the year and you can specify whether to show them by year, month, week or day. To check the entry charges and other information click on Racetrack Planner and scroll down and click on Racecourses Information link. 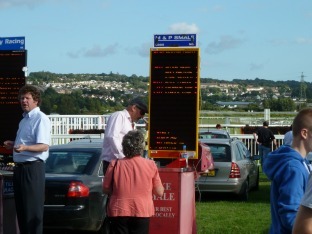 Open the Exeter Racecourse site. The next job is to investigate the best way to get there - car or train? The first race starts at 1.40pm and I will need to check the time of the last race but it is unlikely to be much later than 4.30pm as the light will be fading. This would be useful if I decide to travel by train, so next job is to check cost and times of trains using the Trainline. This looks good - if I leave from my home town Plymouth at 9.35am - arrive 10.41 and return at 6.35pm - arrive 7.41pm the cost is just £3.30 day return and the tickets will be sent to me by mail. Plenty of savings there for beer money. If I skip the premiership badge, (this is no great loss as the standard ticket offers the same opportunities for on course betting on horse racing), I have got into the course and travelled there and back for just £15.30. All the more for our betting on horse racing bank. I said elsewhere that I would be meeting up with my Somerset scout at the meeting so this would be a good opportunity to order that horse picture I've been meaning to buy for her. So a trip to the Easyart page is in order. I have ordered the poster of The Andalucian Stallion for £5.95 + £2.95 shipping. Total cost £8.90. It was quite easy with no problems and I can sort out a frame for it later. Travelling by train is an excellent opportunity to study the form and revise best strategies for betting on horse racing on course. Nick Mordin is still the punters guru and his book Betting For A Living is a must read. Exeter racecourse have made one or two improvements of late and I am hoping it will favour on course betting on horse racing. I will see what the Times Course Inspector has to say. So, the restaurant sounds good but the chances are that it will be fully booked. Also, betting on horse racing on course is best pursued outside, where you can see the horses and assess a horses winning potential by watching them in the parade ring and cantering down to the start. You can pick up clues about their wellbeing, how alert are they? Are they getting worked up, do they canter easily to the start? These clues are not available if you are not actually on course and make betting on horse racing a safer bet! So much for the food but what about a good pint of beer...'The two bars are ... Characterless, ground-floor rooms with a mish-mash of furnishings that might have come from a Sunday market stall, they are poorly stocked and moderately staffed. Like Ludlow, a track of comparable clientele, Exeter would benefit hugely from a cosy bar of the log fire and mulled wine variety. I have now checked the BBC weather forecast for Sunday 12 february and it is likely to be cloudy with light rain. The same is forecast for Saturday, so hopefully the ground will not be too firm. Henrietta Knight, the trainer of Racing Demon, is hoping to run him at this meeting and the more rain the better for him. He is on our list of horses to follow and I will be checking the declarations to see if any others will be running. I have received the train tickets and the picture so that is sorted and I will be rounding up other assessories, such as binoculars, boots, wet weather clothing etc. nearer the time. I will let you know how I get on - and here I am back home again and wow what a super day out it turned out to be - there was only one downer and I'll tell you about that in a moment. I was pleased with the way the travel arrangements worked, the trains ran on time enabling me to catch the free bus to the course and mingling with the other racegoers added to the excitement. Normally I would travel by car but at £3.30 a day return, the train was tremendous value and I would recommend that you check out the train as a possible option. Having teemed up with Ses, my Somerset scout, who advised me to keep an eye on runners for Phillip Hobbs and Andy King, we grabbed a drink at the bar - rather scruffy as we had been forwarned by the Time Course Inspector and headed out to the fray. If you have checked the results for Exeter you will see that my selections fared pretty well. Using the Racexpert software (which seems to work well when applied to on course betting on horse racing)and a system for handicap races devised by a Racexpert forum member (known as Tom)I pulled out the winner Desert Tommy at 12-1 SP. Actually I only managed to get 10-1 on course and found generally that prices were shorter than the big bookmakers and especially betfair. Normally I would not back horses for every race but for the purposes of this exercise, did so. Next up, another handicap analysed by the system produced the winner Gunther McBride at 5-1. Noland is one of our horses to follow and as my only selection for the next race, duly obliged at 6-5. I managed to obtain 11-8 on course but the bookmaker only paid out evens money and in the euphoria of a third win on the trot, failed to notice. The next race was duly won by our horse to follow, Racing Demon, a leading fancy for the Arkle Chase at Cheltenham next month. His price was even shorter on course than his SP of 2-7, (on course betting on horse racing does not always mean a shorter starting price) so we opted for an each way bet on Back Nine at 16-1 who duly obliged by coming in 3rd. This horse, as were all the horses selected for our on course betting on horse racing, was highly rated by the Racexpert software. Our winning streak was bound to end sometime and it did in the next race, where the system let us down. We had been steadily increasing stakes to add 25% of winnings to the next race and this was probably not a good policy. Before this race we were 42.5 points to the good but after was reduced to 22.5 points. We also lost on the next race when Craven, the 8-11 favourite was a big disappointment, thus reducing our tally to 12.5 points. The record for favourites winning in non handicap races at Exeter is 42% so the chances of the next favourite, It's A Dream, failing to follow the trend were small and we duly lumped on, especially as this was the second of Nicky Henderson's favourites and he was unlikely to lose both. However we did have a saver on Sharajan at 25-1, who only narrowly missed out. And so we ended the day 13.33 points up and went home, tired but happy. Oh, and the downer? I left the horse picture for Ses at Plymouth railway station; needless to say when I returned, it had gone.